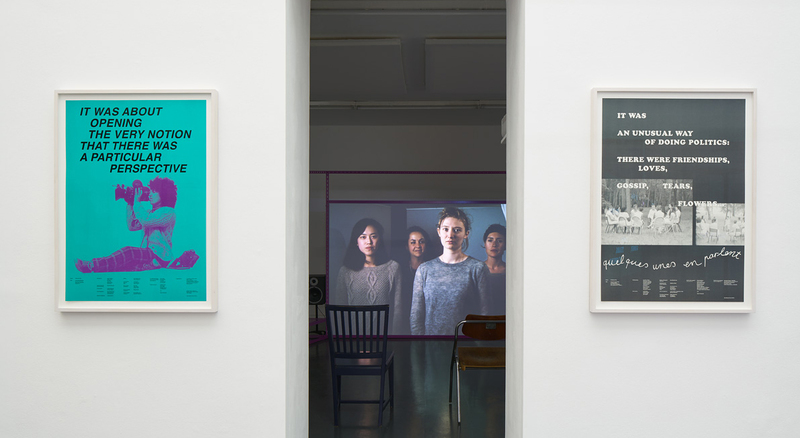 Archive Kabinett presents To Become Two, a film installation and publication by Alex Martinis Roe that stem from her ongoing engagement with international feminist communities and their political practices. Across six films, To Become Two traces the stories of six different, yet connected, feminist groups from the 1970s to the present who have built communities in Europe and Australia. These include The Milan Women’s Bookstore co-operative; Psychanalyse et Politique, Paris; Women’s Studies at the University of Utrecht; a network in Sydney including people involved in the Sydney Filmmakers Co-operative, Feminist Film Workers, the Working Papers Collective and the Department of General Philosophy at Sydney University; and Duoda – Centro de investigación de Mujeres and Ca La Dona in Barcelona. By using various methods such as participant observation, oral history interviewing, and archival research, Martinis Roe offers proposals for how to grapple with contemporary society through feminist methodologies. For the final film, Our Future Network (2016), Martinis Roe established a new network, which resulted in the development of twenty propositions for feminist collective and political practices. More on the publication here. Alex Martinis Roe: To Become Two is co-commissioned by ar/ge kunst (Bolzano); Casco – Office for Art, Design and Theory, (Utrecht); If I Can’t Dance, I Don’t Want To Be Part Of Your Revolution (Amsterdam) and The Showroom (London). The accompanying workshops and performances are co-commissioned by the Keir Foundation. The project was produced with the support of the Graduiertenschule der Universität der Künste Berlin and the Einstein Stiftung and the Australian Government through the Australia Council for the Arts, its arts funding and advisory body. 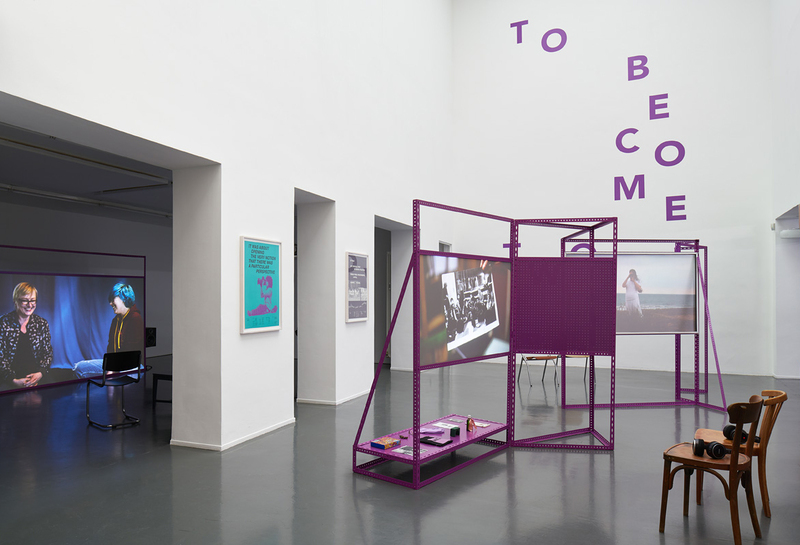 The presentation of To Become Two at Archive Kabinett is supported by the Research School of Humanities and the Arts at the Australian National University. Alex Martinis Roe, To Become Two, Badischer Kunstverein, Karlsruhe, 2017. Exhibition design: Fotini Lazaridou-Hatzigoga. Photo: Stephan Bauman, bild_raum. Alex Martinis Roe is an artist and researcher. She is a former fellow of the Graduate School at the University of the Arts Berlin, and holds a PhD from Monash University, Australia. She is currently completing her project To Become Two: a series of films, workshops, public events and a book, as a social history of the feminist practices which invented the concept of ‘sexual difference’, and collective experiments with this research through the sub-project Our Future Network. This project was co-commissioned as a series of solo exhibitions by If I Can’t Dance, I Don’t Want To Be Part Of Your Revolution (Amsterdam), Casco – Office for Art, Design and Theory (Utrecht), The Showroom (London) and ar/ge kunst (Bolzano) and has also been exhibited at Badischer Kunstverein (Karlsruhe). Parts of the project have been exhibited at, among others, Art Gallery of New South Wales (Sydney), Australian Centre for Contemporary Art (Melbourne), SlyZmud Gallery (Buenos Aires), Dienstgebäude (Zürich), Yvonne Lambert (Berlin), and Hessel Museum of Art (Annandale on Hudson, NY). She is Head of Sculpture at the Australian National University and co-leads the transdisciplinary working group FORMATIONS with philosopher Melanie Sehgal, which began within the framework of the Haus der Kulturen der Welt in Berlin in 2015.